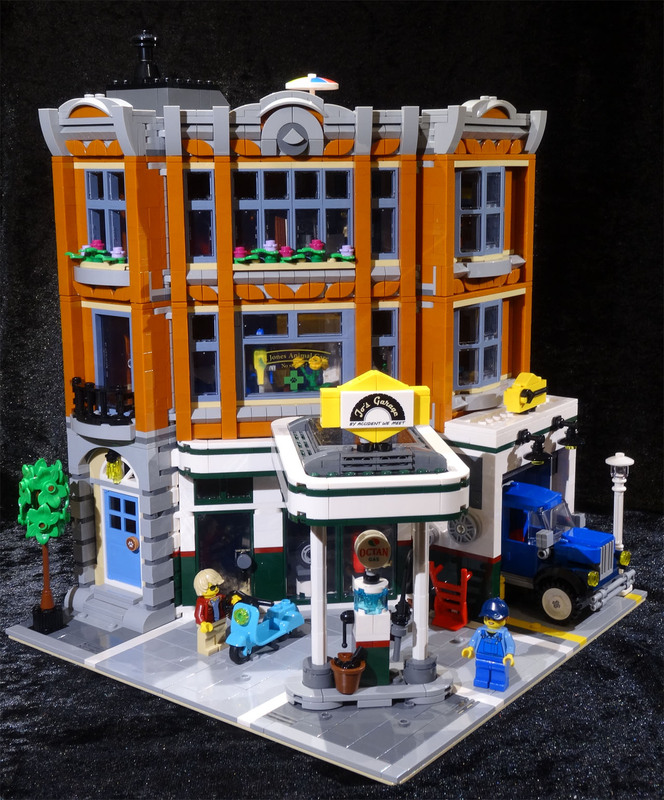 The last year provided a clean break from ten years of Lego modular buildings with the Downtown Diner, which set up a new time period with a 50′s styling. In my review I mentioned that the next set should be a gas station and lo: this is what happened, but with a twist. As I discovered when I built my own variation, a gas station provides very little bulk. The Corner Garage, instead, is a regular building with a downstairs garage and gas drive-through. 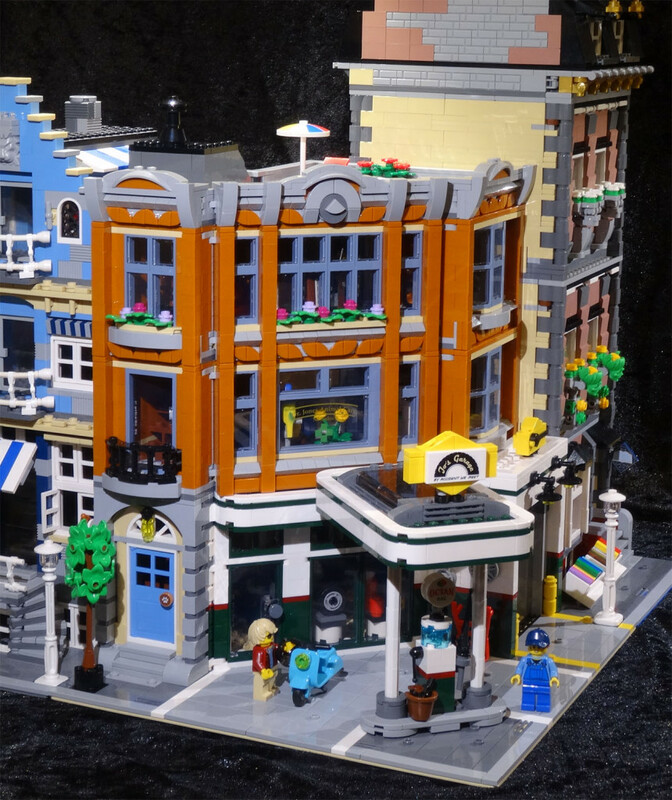 While previous corner buildings have filled up most of the baseplate, this is somewhat moved towards the back. Apparently this creation was a team effort but Mike Psiaki was credited for assisting and there’s some really neat features. Overall, though, Corner Garage has some things in common with Town Hall, which was also a set designed by a newcomer. One is the colour: Corner Garage uses dark orange bricks to great effect for the top two floors. The other, unfortunately, is that the building is kind of dull looking. Most of the front is taken up by windows which use some fun techniques to put in place, but the effect isn’t too obvious. A lot of detail work is made from corner 1×1 tiles and the new 1×1 double slopes, but these are really annoying to line up and the end result isn’t too remarkable. What’s more interesting is the bottom floor and the garage section. It’s made up in a retro version of the classic Octan colours, Lego’s own gas company (and movie badguys). The modern stylings of the overhang makes for a bit of a contrast to the building itself and uses some fuzzy math to get into place, but unfortunately it’s very fragile and you can’t lift anywhere near it. The sign on top was really clever though, and the smaller sign to the right is a throwback to one of my old 80′s city sets. The actual garage door looks like the classic sliding one we’ve seen since back then too, but with a literal twist. Instead of just sliding up (and thus covering the inside ceiling), the door segments are winded up on a spool in a really, really clever and smooth way. 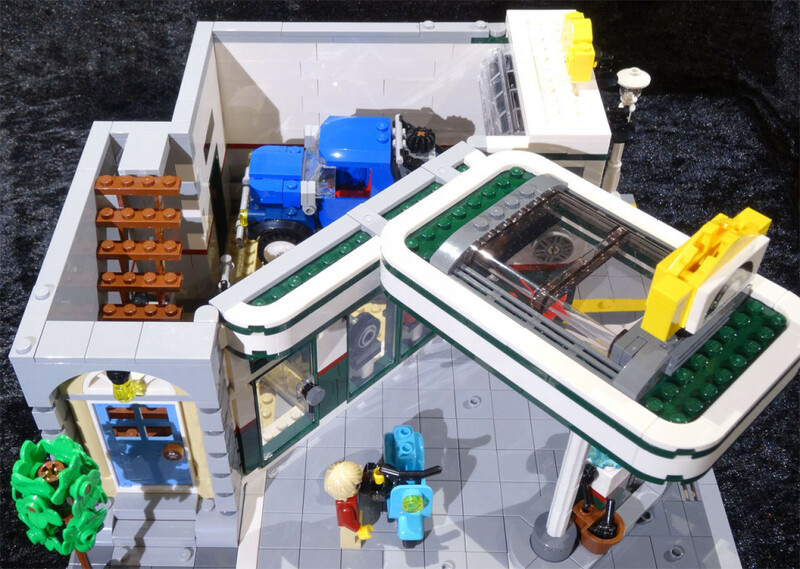 Inside is a repair bay and some tools, including a really detailed tool cart, but also a working car lift. This uses a hidden activator outside to push the forklift arms up and raise whatever is on it. Before we leave the ground floor, let’s also talk about the truck. It follows the general aesthetic of the modular line, with classic stylings without really replicating any actual car. The build is neat overall and provides some brand new parts in dark blue, but most impressive is the towing hook. 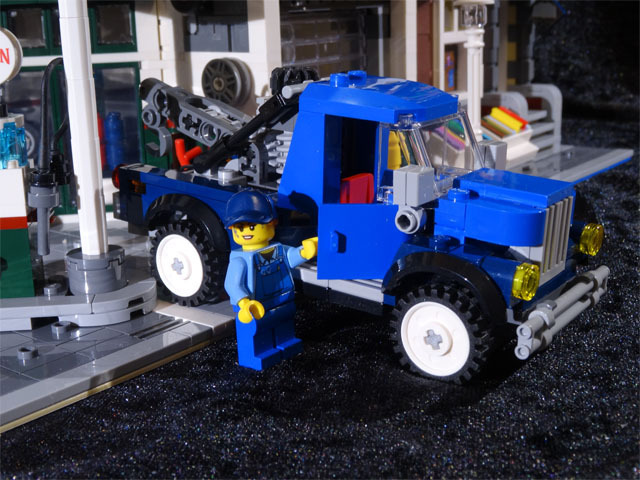 I’ve had tow trucks in Lego since I was five, but they were always very basic. This one packs a working Technic mechanism in a very small area which lets you raise and lower the hook with a wheel on top, in a super smooth motion. This little finesse really helped me appreciate the build. While the garage takes up most of the actual ground floor, a door on the left takes you to a staircase to the second floor. Here is the animal care office of one Dr Jones (”No snakes!”), where the stair landing doubles as a waiting room with a few rather crude sofas, while the actual office is packed with animals and neat medicinal equipment. Without having a clue what these things would do, they certainly look nice. A noteworthy part here is the diagonal wall divider, which connects to the angled front wall. This entire section sits ever so slightly off the Lego grid, using the rather new 1×2 rounded plates to fudge the math a bit. There is no stress on the parts, and it works very well, although in hindsight I would have preferred something to cover up the corner gaps on the front. Now we get some unsightly gaps and some messy colours. Moving up to the third floor we have a rather standard apartment. There’s a CRT TV here which does still look much too flat for the time period, and a nice little kitchen which for some reason also houses the bed and has a tiny toilet door in the corner. There isn’t much to say about the decoration here, but the flowers outside add a bit more interest to the look. Although the bay window, which is the same on both floors, is a really neat build that uses the classic telescope part in a way I never would have thought of. Once you take the stairs up from here you end up on the roof terrace with some flowers, a lounging chair and an umbrella, although none of the included figures are really dressed for sunbathing. Overall I’m fairly pleased with the set, but this time the amazing creativity was put mostly into the mechanical functions which isn’t really what I look for in a modular building. The style works well together with Downtown Diner and I will definitely find a place for it once I actually have space for a full city (for now many buildings must stand alone). However, the non-standard design has a few consequences. The entire building is offset a bit and doesn’t really comply with the standard of 8 studs wide sidewalks. As a result, the entrance on the left side sticks out a couple of studs in front of whatever is placed next to it, and on the right the sometimes messy sides of the next building can be seen above the protruding garage section. 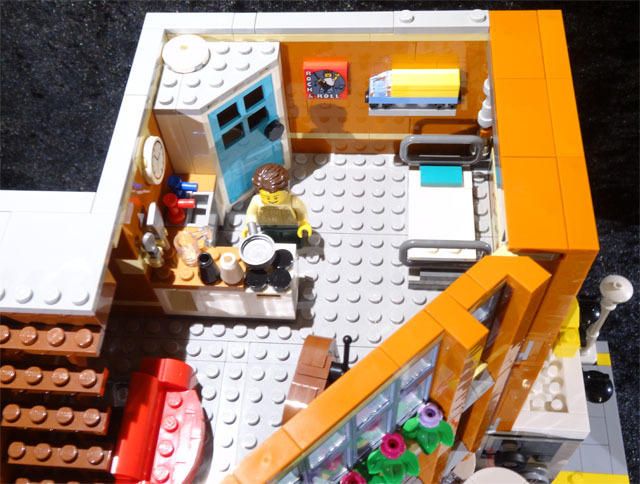 So overall, this is another fine modular set but it doesn’t blow me away. Personally I still prefer the classic pre-war look to the 50′s Americana style, and even though the last two sets have a style of their own I’d like to see something that bridges the gap – maybe a more classic straight building with a late art deco style? Meanwhile I have a bigger project – if I’m ever going to have room for the ever growing collection, I will need a bigger home! 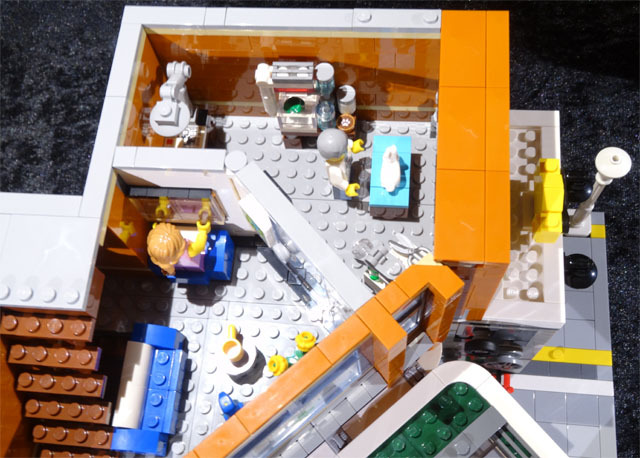 Det här inlägget postades i Prylar och har märkts med etiketterna Lego, Lego Modular Buildings. Bokmärk permalänken.